Soy sauce and miso are made by fermenting soybeans, and are indispensable seasonings to Japanese cooking.Because they are fermented soybean-based foods, they taste great and contain high nutrition. 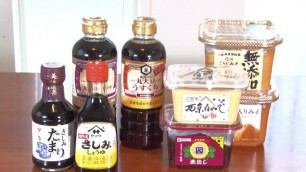 There are several kinds of soy sauce, such as dark soy sauce、light-tasting soy sauce、tamari soy sauce and so on. Dark soy sauce is the most common type of soy sauce. In general, when we say 'soy sauce', it means dark soy sauce. Dark soy sauce is always available in most Japanese homes. Compared with dark soy sauce, light-tasting soy sauce is light in color and weak in flavor. It's good to use for broth flavoring in dishes such as savory egg custard, soups and so on. Tamari soy sauce has a rich flavor. It is used as soy sauce for sashimi. Soup base is made by mixing soup stock、Japanese sake and sweet sake in soy sauce. Besides being used as the soup for Soba and Udon noodles, it's a convenient seasoning which can be fit for many other uses. Because soup base contains not only soy sauce, but also soup stock and sake, it's used by more and more families for seasoning boiled dishes such as meat and potato stew and so on. However, if you use soup base too much, all the dishes will taste the same, so it is better to think about ways of cooking to your liking, for instance, adding some sugar when cooking boiled dishes, add vinegar when frying or dipping. Depending on the different regions, there are many kinds of miso, such as dark-brown miso、light-brown miso、spicy miso, sweet miso and so on. Recently, more and more families are using miso products containing soup base, called "miso with soup". Because the flavor of miso will deteriorate if it is heated, miso should be added and dissolved immediately before turning off the heat when making miso soup. Miso is used in not only for miso soup, but also for other dishes such as mackerel cooked with miso、meat cooked with miso and so forth.Without heatung, miso can also be eaten mixed with sugar and mayonnaise as a vegetable dip.